Michigan has become one of a handful of states to authorize the use of digital license plates, joining California and Arizona in modernizing the 125-year-old practice of stamped metal plates. The state of Michigan is working with Reviver Auto, creators of the first and only digital license plate, to roll out the plates to interested parties. 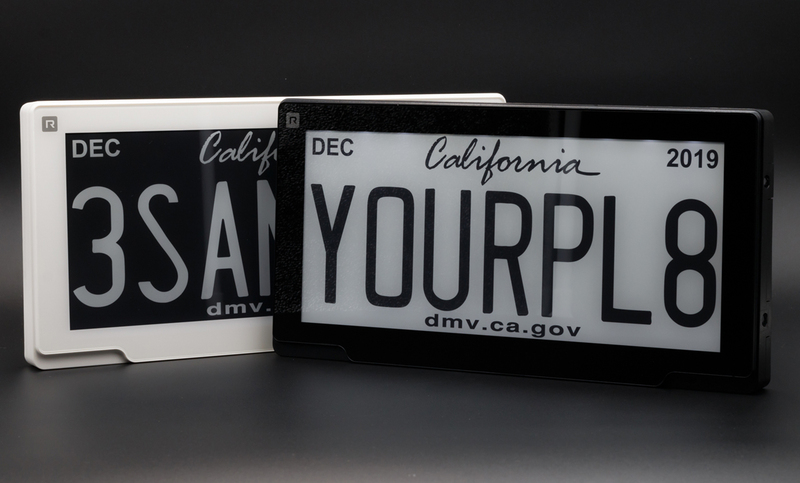 Reviver Auto’s digital plate, the Rplate, debuted on California roads in mid-2018 and offers a number of benefits over traditional stamped plates. A digital plate can automate the vehicle renewal process, replacing legacy stickers with digital decals and eliminating the need to visit your local tax collector’s office or submit a request by mail. A digital plate can also enable new levels of personalization, potentially allowing drivers to promote charitable causes, passion for a sports team or their child’s academic achievements. The Rplate even offers geo-fencing capabilities for business and government entities and can assist with stolen vehicles. Future features could include Amber and weather alerts as well as marketing capabilities. Advertising on your license plate, I’m sure you’re thrilled at that prospect. A standard Rplate will set you back $499 while a premium version with advanced telematics commands a cool $799. Both begin shipping this spring, we’re told. I don't see this getting exploited or going wrong in any possible way. ypsylon, Right side bob, Lew Zealand and 12 others like this. You forgot your sarcasm tags there. SalaSSin, GreenNova343, xxLCxx and 2 others like this. So basically there is no real benefit to this unless you are managing a fleet of vehicles. I thought it was pretty interesting at first. Checked out their website and once you spend 500-750 bucks on a plate you'll also have to plan for another 100 a year for their subscription service (which is required to use the plate). You get the first year free, but then every year after you must pay. I cannot see the use for this now. wiyosaya, xxLCxx and psycros like this. Next up: Digital passports on e-paper, digital money on e-paper and toilet e-paper (for multiple use). learninmypc and kombu like this. The stamped plates are just about free. I believe people in prison still make them? It gives them something constructive to do. Are they going to be able to make these? I am thinking a strong "no". It is insane to spend this much on something so simple. Just think when one gets stolen. People damage the steel ones all the time from loading their vehicle or backing up for a trailer among many other ways. Salt from the winter will get inside these and corrode the electronics. People don't need yet another sign with changing info on it. The animated billboards are bad enough (if people are not playing on their phones already). Not to mention a huge undertaking to manage the infrastructure for this. I am seeing an epic fail. The cons far outweigh the pros that I can see. Please let this be a "should we" instead of a "can we". JamesSWD and xxLCxx like this. This is one of the best examples so far of technology for its own sake. Literally NONE of the supposed benefits associated with digital plates come without multiple extra costs. If you like all your single player games to require Internet, your toaster to eavesdrop on you and your a door lock to be hackable from anywhere, this is the license plate you want. Capaill, Lew Zealand, wiyosaya and 4 others like this. Are you kidding? $500 to $800 for one of these? Let me know when they are 1/10th of that price and I'll have some interest. Besides, what are prison inmates going to do now without their license plate making jobs? Creep on your children's Facebook pages, no doubt. It's all about the target audience. People with more money than sense, who want a fancy customized license plate that they can change to suit their moods, maybe. Or secret agents! Imagine, James Bond could flip to a new license number without needing that pesky mechanical license flipping apparatus taking up space that could be better spent with extra weapons or ammunition or oil slicks dispensers, etc. Q will love it! I mean other than those *****s with moar cash than brains! Entry #441,823 in the list of solutions to problems nobody has. xxLCxx and SalaSSin like this. Definitely no chance of someone ever hacking these to display rude and profane messages to law enforcement or other motorists. Hey cool now once I figure out how to modify the numbers on the plates I can go start robbing banks. I stick to my good-ol metal plates!